Earth is huge, so it’s to be expected there might be a few scaly critters about that are a little large for mankind’s liking. Maybe it’s because bugs don’t smile, or perhaps it’s the lack of shaggy fur and their inability to sit on command that turns us off. Generally speaking, they just creep us out. 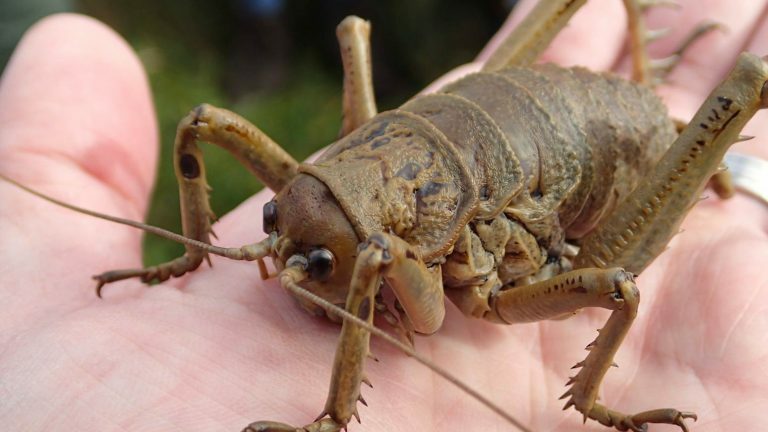 The largest insect ever found in modern times, a giant weta discovered in New Zealand three times the size of a mouse, ate entire carrots whole. That’s fine, until you start to picture the carrots as human fingers and then things start to get a little… unsettling. Look on the bright side, though-300 million years ago there was a predatory dragonfly roaming the skies with a 27-inch (68.5 centimeter) wingspan and massive mandibles. Beetles can get big. Like, really big. Titanic, really. 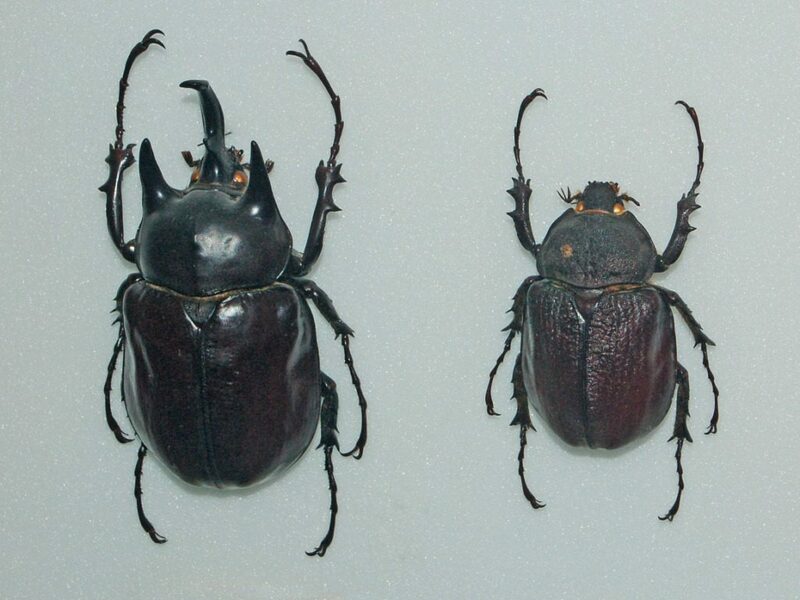 For example, the aptly named Titan Beetle. Imagine traipsing along in the Amazonian rainforest, as we are all apt to do from time to time, and stumbling upon a 6 and a half inch monster scuttling along. Our advice, when you hear it give a loud hissing noise: stay clear. That means it’s threatened, and that’s not a good thing. These guys have huge mandibles strong enough to snap a pencil in half, and capable of ripping into human flesh, too. Oddly enough, a lot of people find themselves traipsing around the Amazon because of the Titan Beetle. Ecotourists flock to south America hoping for the chance to catch a glimpse of these guys. 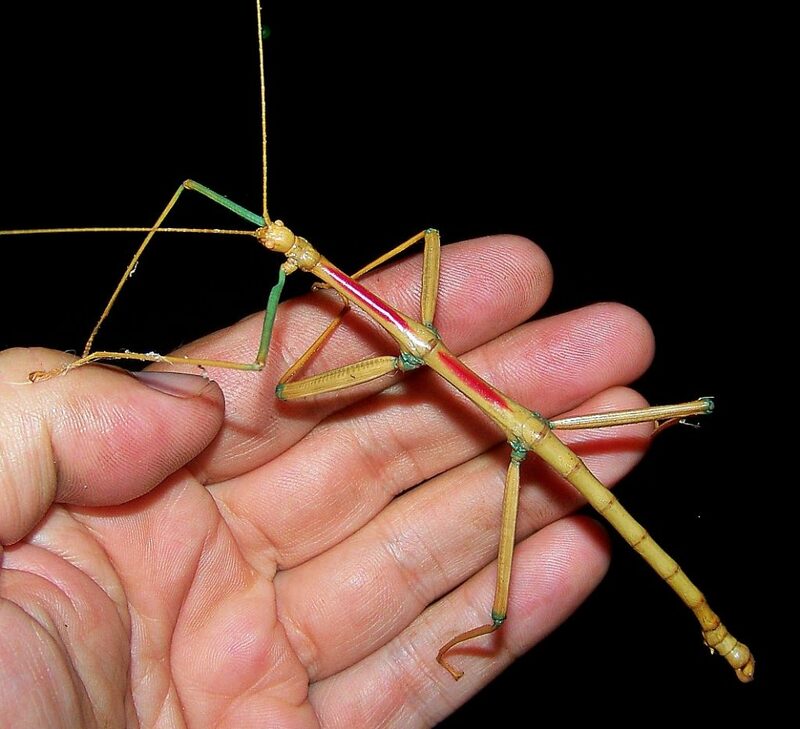 Stick insects are long, thin bugs that look a lot like, well, sticks. When you live on branches, what better way to stay hidden than to blend in and look like one. Of course, it means you can’t move around a lot or it’ll give the game away, so stick insects tend to stay completely motionless in the day and only creep around at night. But if they are caught in daylight, various species of stick insect have developed some effective defence mechanisms. Some just play dead. Some will sacrifice a limb to get away from a predator. But some will spray a would-be eater of the bug with a nasty-smelling mist. Generally, they’re pretty harmless, though. The biggest of these bugs is appropriately named the Giant Walking Stick, and can grow as long as 2 feet from tip to tip. Some kids in Southest Asia where the Giant Walking Stick is found even keep them as pets. On the heavy side of the insect world we find the Giant Weta, which are only found in New Zealand. Thank goodness. Related to crickets, these monstrous beasts can be over 4 inches long, not including legs and antennae, and weigh over 2 and a half ounces, which is more than a sparrow. 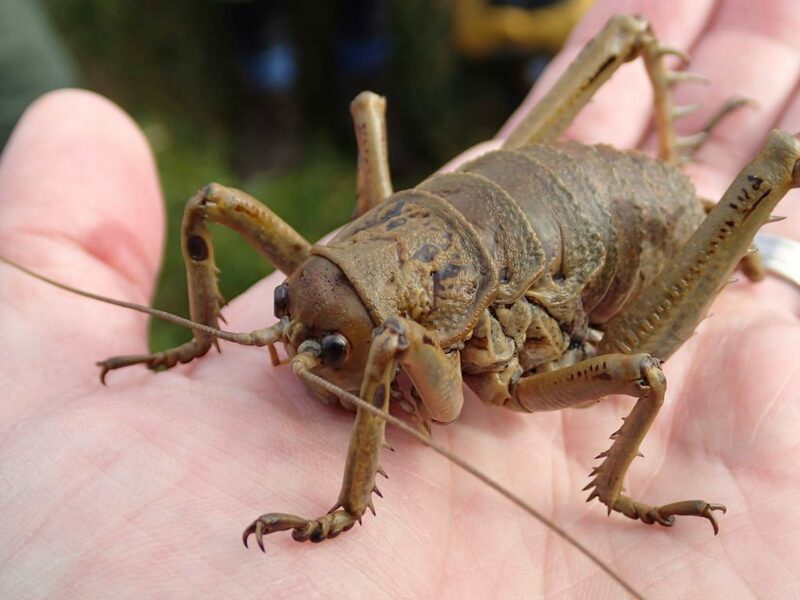 They’re so big that unlike their cricket relatives, Giant Wetas are too heavy to jump around or fly. Over in Africa, they grow some big beetles. Take the Goliath Beetle, a dense 4 incher that can be 3 and a half ounces in its piggy larval stage. Not only are they big, they’re lazy. They like to wait until late in the day after the sun has had a chance to warm them up before they start moving around, kind of like a teenager. 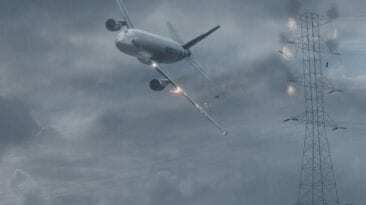 They can fly. Fortunately, they like to save this trick for escaping when they’re scared, not to pounce on innocent passers-by. But that could change. Although they seem to be vegetarian in the wild, captive ones have shown a hankering for protein and will happily chow down on dog and cat food. Let’s try not to think about what could happen if one gets a taste for human flesh. I’ve seen that movie, and it ends poorly. For humans. Say, that’s a nice purse, what’s it made of? Gee thanks, it’s an moth cocoon. The Atlas Moth is a bird-sized bug found in the Malay archipelago, and some fashionable Taiwanese women do indeed use their huge cocoons as purses. During their caterpillar stage the moth can be over an inch thick, but it’s not until they grow up that they become truly spectacular. With a wingspan of over a foot and up to 60 square inches of wing space, you do not want to have to clean one of these off your car’s windshield. So, how’d you like to meet a wasp that eats tarantulas? 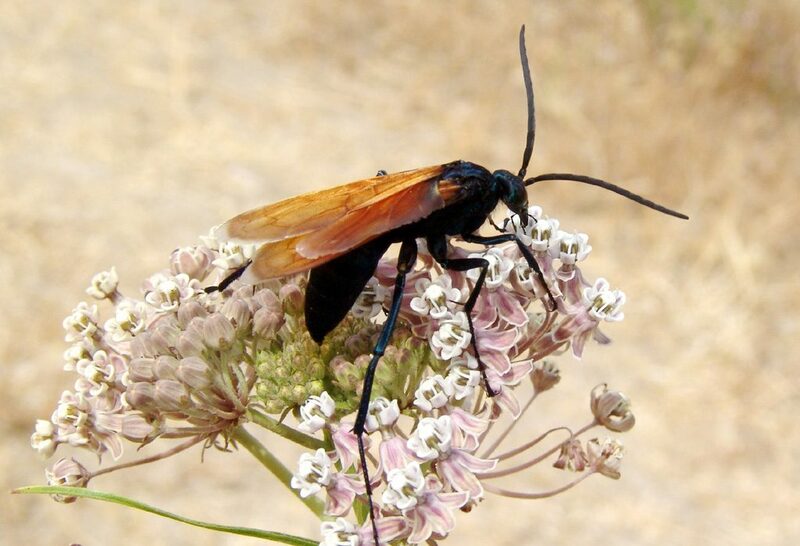 Well say hello to my little friend, the Tarantula Hawk. Actually, not so little, and totally not my friend. And not a hawk, it really is a wasp. A very big wasp. Tarantula Hawks aren’t just big, they’re aggressive too. Luckily, they only act out if you bother them, so don’t bother them, or when their babies are hungry. Unluckily, their babies are also very big, so they’re hungry a lot. Luckily, the Tarantula Hawk has found something that is exactly the right size for feeding its brood. Have you guessed what that is yet? So yeah. Here’s how a Tarantula Hawk hunts a tarantula spider. The wasp’s legs have hooks on the ends which they use to latch onto their kids’ lunch, then they stab id with their stinger (wasp, remember?) which can be as long as a third of an inch. Be glad they prefer to use the stinger on spiders and not on you, because their venom is rated as among the most painful in the world. Not all cockroaches are created equal, which is to say that not only are some a hell of a lot bigger than others, but some also aren’t so bad. As luck would have it, the biggest may also be the best. 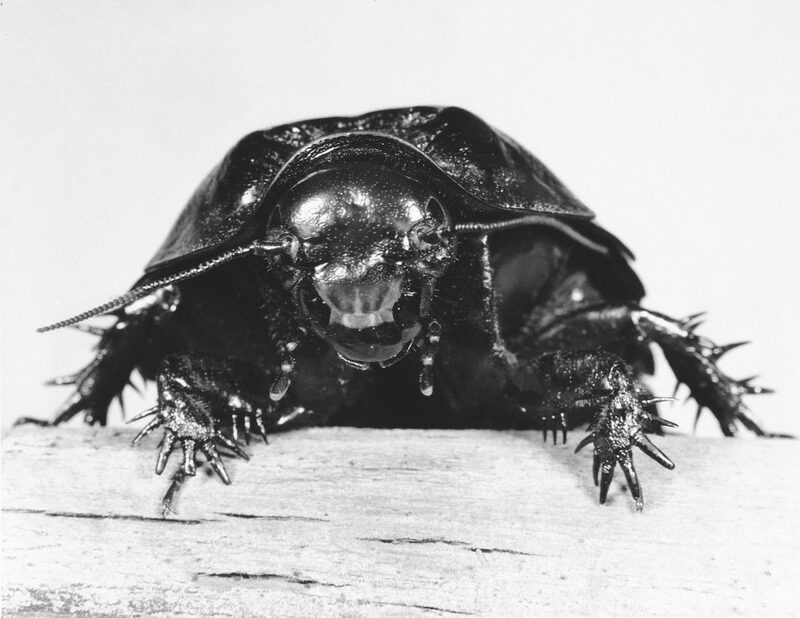 Meet the Giant Burrowing Cockroach, also known as the Rhinoceros roach or the litter bug. It’s the heaviest cockroach in the world. A native of Australia, they can grow over 3 inches long. Mercifully, this big guy doesn’t have wings so won’t be flying into your face any time soon. It also does not live under your fridge and eat your food, but plays an important role in its ecosystem by breaking down dead leaves. And not only is it not considered a pest, but some people swear they make good pets. But be sure before you adopt one, they can live for 10 years. That’s a long time to have to live with an unwanted giant cockroach. Queen Alexandra’s Birdwing is another aptly named bug, because its foot-long wingspan is definitely more appropriate got a bird than for a butterfly. 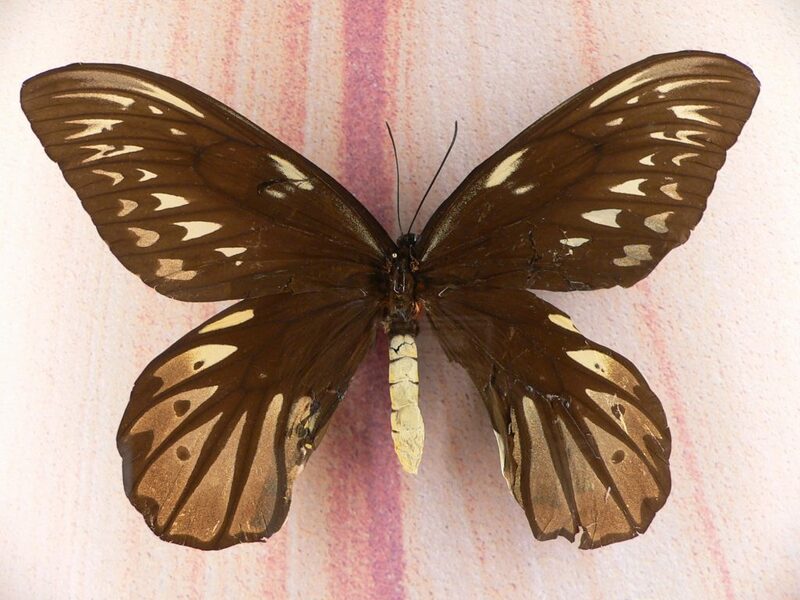 This, the largest butterfly in the world, is found only in remote regions of Papua New Guinea. 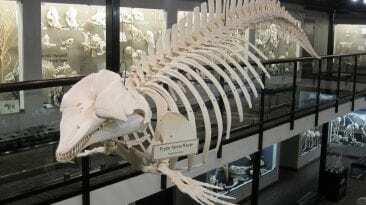 It’s so big, the first specimen ever found was taken down using a shotgun. That was only about 100 years ago, and it’s already an endangered species. But not because of all the lepidopterists out there hunting them down for their collections – although they are highly prized and very valuable – no, they’re almost extinct mostly because we like cookies. Palm oil has the rare quality of being solid at room temperature, which makes it an excellent substitute for butter in products that need a long shelf life. Like, say, cookies. 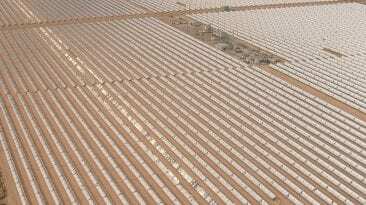 Unfortunately, palm oil comes from trees that only grow in certain places. Like, say, where certain enormous butterflies live. 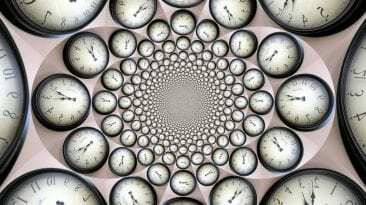 A lot of the bugs in this list are pretty benign. Some are downright helpful. Not so the Giant Water Bug. 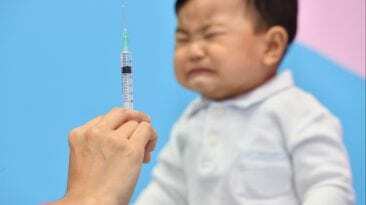 In Southeast Asia where they are commonly found, they are also called “toe-biters” and “alligator ticks,” which tells you something about why we’re not so fond of these critters. At 4 inches long, they are on par with some of the largest beetles in the world, but unlike most of the other beetle, these guys are mean. They come equipped with very large pincers which can deliver a very painful bite. Hence the toe-biter nickname. They are pretty intense predators, hunting through streams and ponds for prey to grab with their big nasty pincers. Once they’ve grabbed dinner, they stab it with their beak and inject their poisonous digestive juices which turns their prey’s insides into soup. Then they wait a little while soupification occurs. Then the beak goes back in and they slurp up their liquid lunch. You might think this would put them on the top of the local food chain, but you’d be forgetting that nothing is above us on that chain. Which means no food is below us. 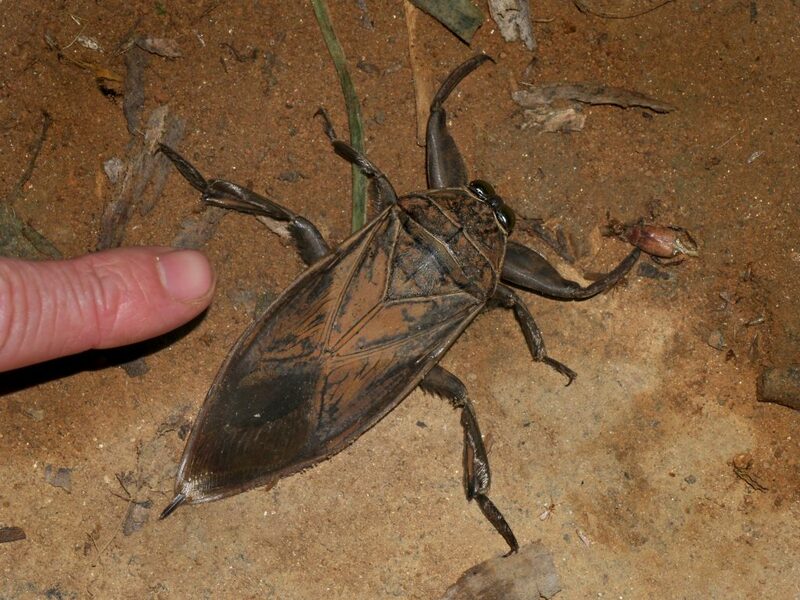 Giant Water Bugs are a local delicacy in Thailand, where people use black lights to lure them in. We’ve met some big beetles so far, but the biggest of them all is the Hercules Beetle. These bad boys swagger around the jungles of South America, showing off the huge horn-like pincers on the foreheads of their impressive 7 inch long bodies. At least, the males do – the females don’t have this distinctive feature, although the girls’ bodies do grow a bit longer. 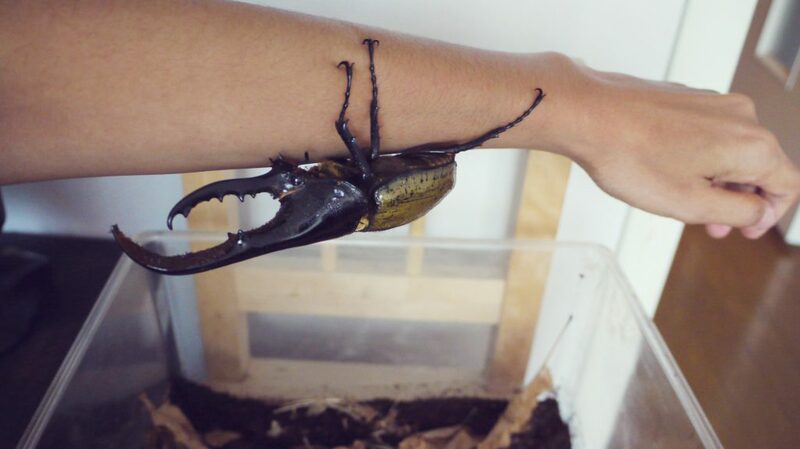 The horns, which can grow longer than the male Hercules beetle’s body, and are mainly used for fighting other Hercules beetles. Men are the same no matter what genus or species, it seems. Proportionately speaking, they are the strongest creature on earth for their size, able to carry 850 times their own body weight. 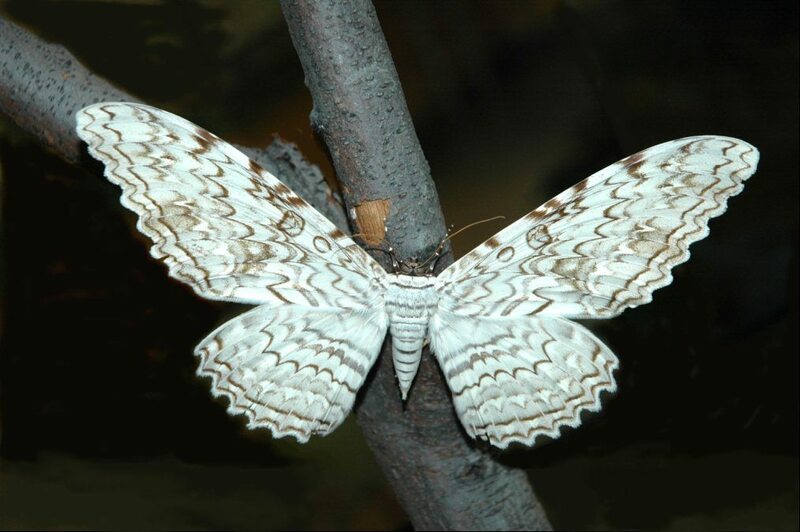 If you walked through a forest in South or Central America and passed by a tree where a White Witch Moth was sitting, even though its wingspan is 12 inches more, odds are you wouldn’t even notice it. Their colouration is beautiful, but also perfectly adapted to blend in with their favorite trees. 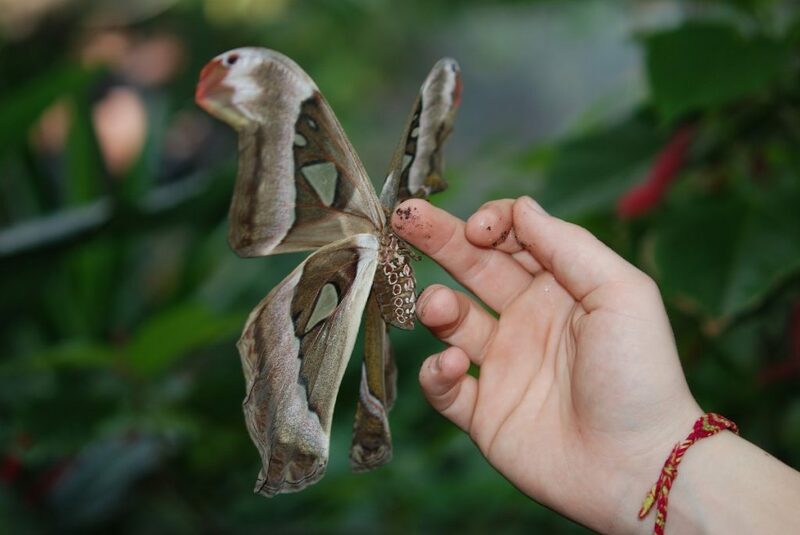 But tree bark isn’t the only thing this giant bug gets mistaken for, when flying it’s so big that it often gets mistaken for other flying creatures, such as bats. Red driver ants are big. The males are really big. But the queens…they’re scary big. Like, 2 inches big. And they have just the kind of attitude you want in a huge ant: really aggressive with a bite like hot burning lava. You can find them in the lower parts of Africa, roaming around in nomadic colonies numbering in the thousands. They march around going wherever the food is, which can often be where people are. Compost piles are known to be a smorgasbord of treats for Red Driver Ant colonies, where they settle down to devour every scrap of edible goodness hidden within. They are rarely disturbed while they feast. After all, are you going to be the one to tell a 2 inch ant with a sting that won’t kill you but will make you want to die all the same that they can’t eat your garbage? Look, flies are gross. Beyond being annoying, they live in poop and spread it all over your food when they land there to barf their digestive fluids onto it. But at least they aren’t big. Well, most aren’t. Some are positively enormous. 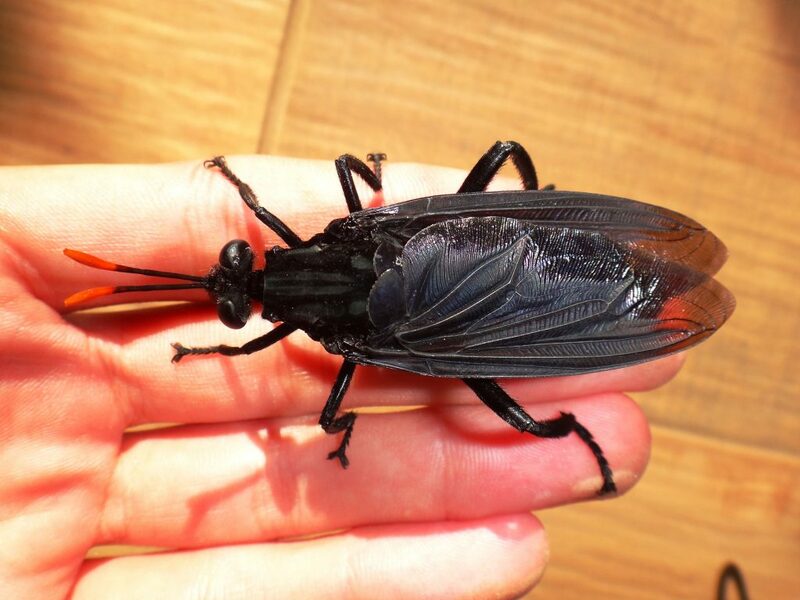 The largest fly in the world, is Gauromydas heros (or sometimes Mydas heros). 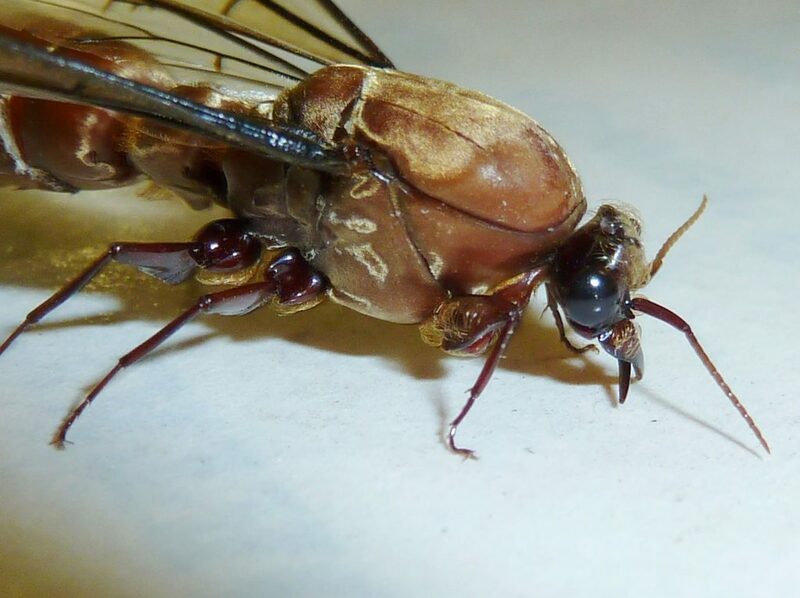 These horrid creatures can grow nearly 3 inches long, which is about as big as a fly can functionally be. 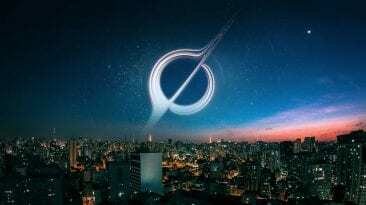 We know this, because someone actually studied it and determined that ambient temperature sets a limit on the metabolic rate a fly can achieve, and thus on how big it can afford to grow. 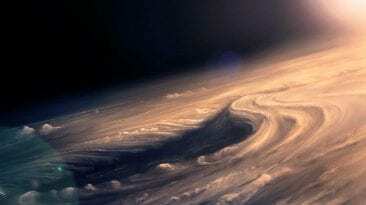 And with Earth’s climate and atmospheric makeup the way it is, around 3 inches is it. But at least they won’t go landing on your picnic, because unlike the ones buzzing around in most houses these flies appear to feed from flowers, perhaps drinking nectar. However, the larvae seem to be predators. The homes of leafcutter ants is where G. heros larvae like to hang out, where they feast on the larvae of other insects that are eating the ants’ waste. Male G. heros hang around the ants’ mounds too, getting all territorial about defending the nearby are, too. That’s because the females lay their eggs there, and apparently men really are all the same, regardless of genus or species. The Amazonian rainforest is not the place you want to be if you’re not a fan of really big bugs. Another huge beetle found there is the Acteon Beetle, which can reach lengths of more than 5 inches long and can grow over and inch and a half thick. These friendly critters have virtually no predators, partly because it’s covered in thick armor with powerful legs and huge claws made for climbing trees but also handy for pinching uninvited guests. 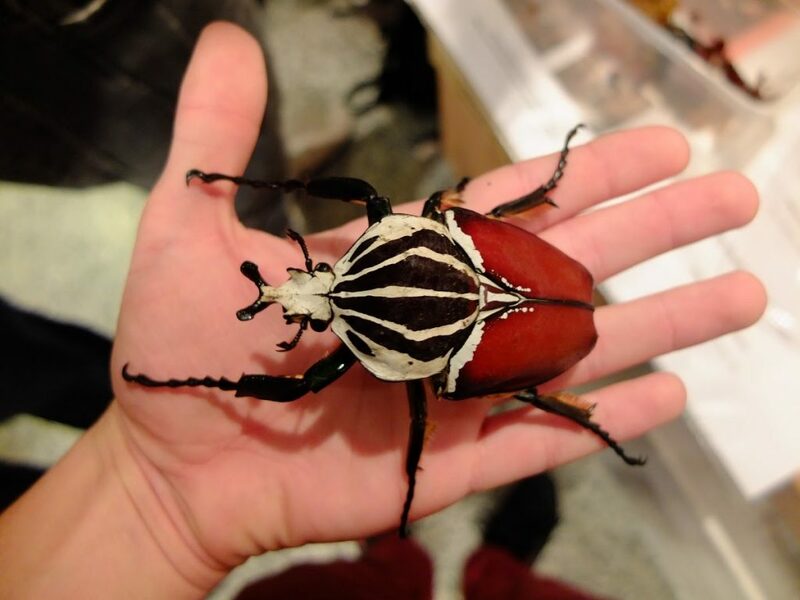 But mostly nobody bothers the Acteon Beetle because it’s just too frigging big. 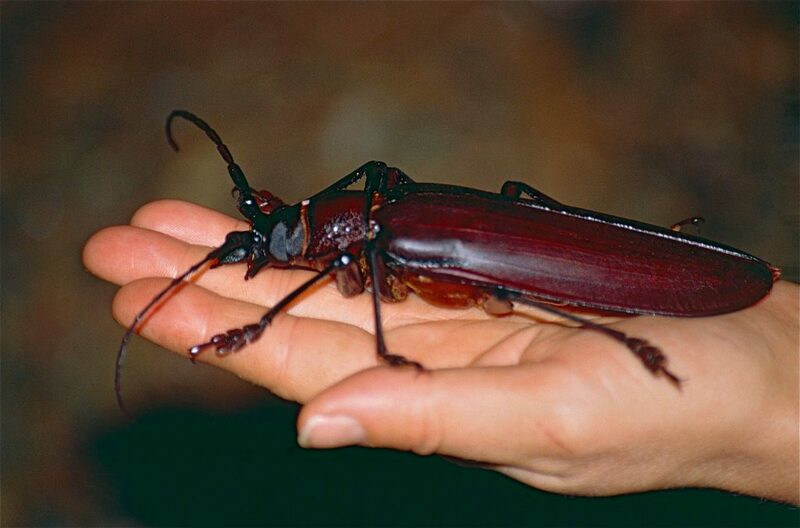 And like most enormous bugs that won’t hurt you, Acteon Beetles are sometimes kept as pets. Unless you’re one of those wacky bug-lovers, you probably don’t want to meet any of the insects we’ve seen so far. But here’s one to wrap up our list that would test the nerve of even the most intrepid entomologist. A creature like this can eat pretty much anything it wants, but thankfully Arthropleura chooses to dine exclusively on plants. Lucky for you there is no chance you’ll ever stumble across one of these monsters, because they all died out around 300 million years ago.